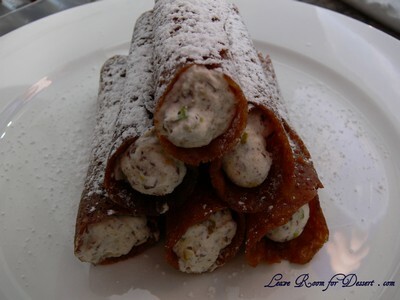 I wanted to make both a main meal and dessert and what better than Cannelloni and Cannoli? 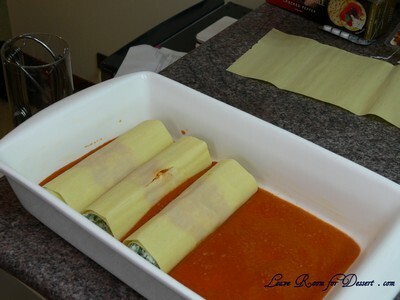 I knew I wanted to make spinach and ricotta cannelloni, so that was an easy choice. 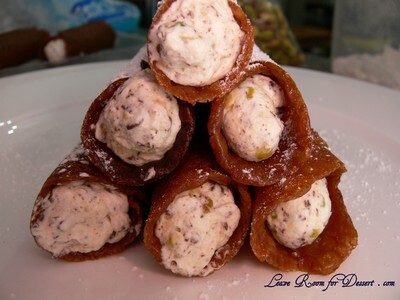 When it came to the Cannoli (which I have never even tried before, let alone made before) I wasn’t organised enough to find somewhere that actually stocked cannoli tubes or forms (metal tubes used to stick the pastry together, which is then placed with the pastry into hot oil). I searched the internet and called stores around Sydney City and there was nothing to be found! Essential Ingredient said they normally stock them, but unfortunately they were out of stock too! (Not that I had much time to go and get them anyway). Guess I will put this on my birthday or Christmas list – along with a pastry bag, sugar thermometer and some new cookbooks 🙂 . 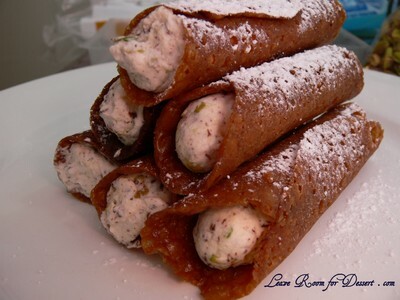 So I guess the quick version will of cannoli will have to do and I bought some pre-made brandy snap tubes. I’ve seen the majority of recipes using ricotta, although the pack suggested using whipped cream, so seeing as it was already not exactly what I wanted to make, I went with the cream version. 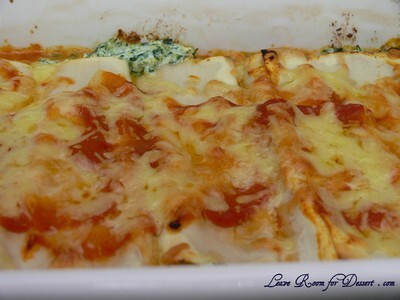 The spinach and ricotta cannelloni turned out lovely, with the tomato sauce a MUST! (even more could have been made). The cannoli was beautifully tasty, with sweet vanilla cream, chocolate and pistachios. Make the tomato sauce by sautéing onions in oil in a large saucepan heated over medium heat. Once onions soften and become translucent, 5-10 minutes, add the garlic and stir for a minute. Add tomatoes, stir then add salt, sugar and tomato paste. Cook for 5-10 minutes over medium heat until reduced slightly. Blend in a food processor or with a hand blender in the saucepan. Set aside to cool. In a large bowl mix ricotta, spinach, parmesan cheese, parsley, basil, salt and pepper. Pour a third to half the tomato sauce into two lightly greased lasagne dishes. Preheat oven to 180°C. Lay each lasagne sheet out on a clean bench or board (you may cut the lasagne sheets in half if you want less pasta). 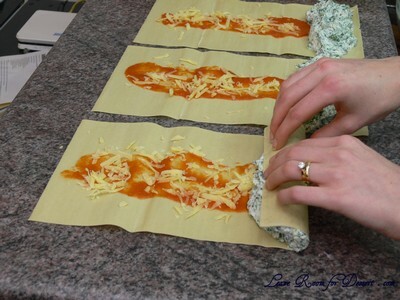 Add a spoonful or two of tomato sauce onto the lasagne sheet and spread around the middle, missing the rolling ends. Sprinkle with some grated cheese. Add a large amount of spinach and ricotta mix onto the short edge of the sheet, making it evenly distributed. Roll up to form a tube and place on top of the tomato sauce with the loose edge down. 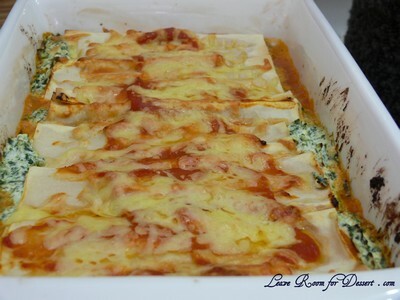 Continue with remaining lasagne sheets, until all mixture is used up. 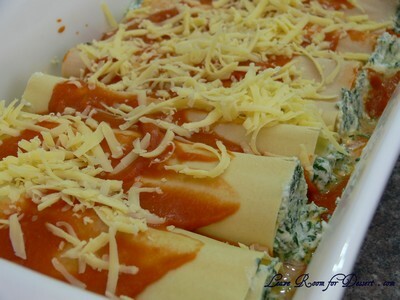 Place the remaining tomato sauce on top of the cannelloni and sprinkle with cheese. Cook in preheated oven for 20-30 minutes or until browning on top. Serve with salad or herb bread. Beat thickened cream with vanilla and sugar until medium peaks form. Fold in chopped pistachios and chocolate and place in pastry bag with star nozzle (or place in cake decorating bag without nozzle attached. Pipe into tubes and dust with icing sugar or icing mixture. Serve very soon after piped. 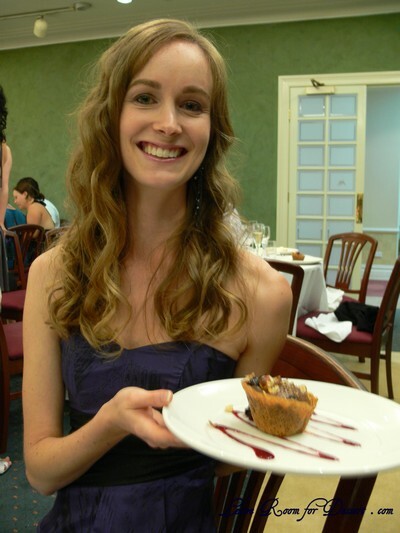 Filed under Cakes, Slices and Biscuits, Cooking Class - Family, Dessert, Healthy Eating, Main Meals, Recipes, Vegetarian. You can follow any responses to this entry through the RSS 2.0 feed. You can leave a response, or trackback from your own site. 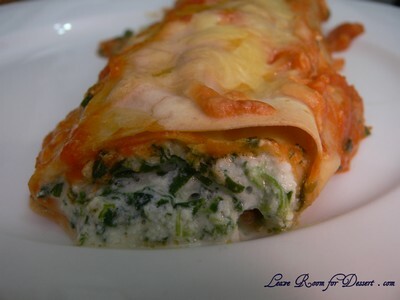 Mmm that shot of the cheesy spinach filling oozing out of the cannelloni is making my mouth water. I love how you keep making all these dishes that are perfect for winter! two of my favourite italian dishes. Drool factor 10 right here, especially all that cheesy filling…..in both! Can can cut up pieces of bamboo for the tubing to wrap the cannoli pastry around and then deep fry, much safer than metal. I tried making my own shells once, and swore never again. Way too much fiddling and splashing oil always makes me nervous. 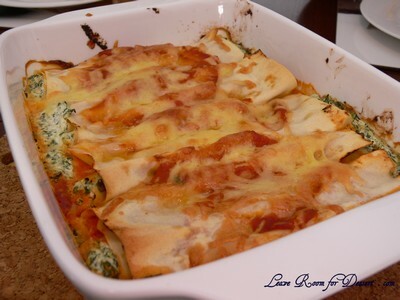 I always buy my cannelloni shells from the supermarket, I’ve never tried it with lasagna sheets before. 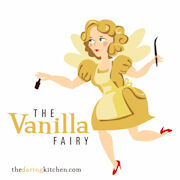 But I have tried them with a savory crepe mixture, freaking delicious! What a great recipe just love the photos which makes it real easy to understand the process. 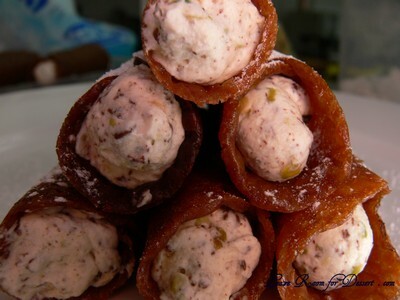 And the cream filled brandy snaps look to die for. Maybe you should try David Jones they seem to have a lot of stuff or how about Victoria’s Basement. Thanks for the nice comments on my blog. Wow what a fantastic post – I really enjoyed reading it. 🙂 I love the spinach stuffed cannelloni and the brandy snaps look gorgeous…..give me tubes for a theme any day! That’s certainly a recipe to feed a crowd – what a lot of ricotta! It looks like a great combination of cheesy and tomatoey. Pistachio and chocolate is a good combination for dessert too. Hi Beta Gal – That sounds great!! I must try some bought ones – and try and make these chocolate ones – yum! Hi Maria – I did read on the net about substitutions for the metal cannoli tubes and one thing was a broom handle which wasn’t painted, but we have one broom with a wooden handle (which I thought the pastry might stick to) and one broom with a painted handle – which i didn’t want to cut and it shouldn’t be painted… they do sound like a bit of a hassle and hazard with the oil. Hi Jeena – Thanks! Yep, tube theme cooking is great for any day!